Composer Arthur B. Rubinstein passed away on April 23d and film music community worldwide paid homage to a composer who dedicated a large part of his career to television and only a little over a dozen movies consisted his entire cinematic output. Listening to Rubinstein’s music for the cinema and television industry reveals some truly outstanding work and it is a wonder why this gifted composer wasn’t involved in more important projects especially during the 80s, when his masterpieces for BLUE THUNDER and WARGAMES, and his fantastic music for tv series like the ones for THE PHOENIX (1982) and SCARECROW AND MRS KING (1983-86) stole the show. 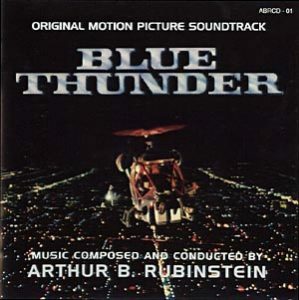 Rubinstein’s music for BLUE THUNDER was a sensational piece of work. A score that actually introduced the sophisticated synth score to the film industry, the score that had a symphonic structure but was performed in a music synthetic machine. I can only recall of John Scott’s INSEMINOID as a score that had a symphonic orchestra structure but was performed in synths mainly, before Arthur B. Rubinstein’s work for BLUE THUNDER. 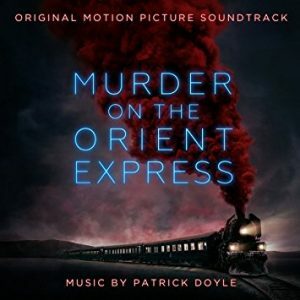 There was of course an outburst of the synth score right after Giorgio Moroder composed the music for MIDNIGHT EXPRESS but none of these had a symphonic approach before being performed in a synthesizer. Even Vangelis’ music for CHARIOTS OF FIRE had a more ambient and contemporary form even though it was composed for a period movie about religion! Having mentioned about the importance of this film score to film music in general, it surely may sound a little odd that director John Badham and the movie’s producer, initially didn’t want Rubinstein to compose the score! 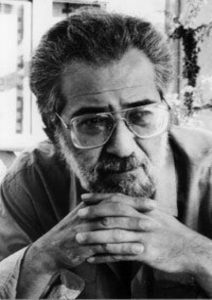 The composer was a close friend with the director and after their first collaboration for Badham’s WHO’S LIFE IS IT ANYWAY in 1981, Rubinstein straggled to get the commission for the score of the BLUE THUNDER an action movie about a powerful surveillance helicopter and a criminal conspiracy that is unfolded around it. He sent a demo tape to John Badham with snippets of his work for THE PHOENIX, the series i mentioned above, for which he composed a synth score with a very simple but brilliantly orchestrated main theme and many moments of climax that showed his ability to compose multi-layered pieces of music for a synthetic machine. As the composer told Randall Larson in an interview a long time ago, the producers and director wanted desperately a score by Giorgio Moroder or Tangerine Dream but after John Badham listened to the demo tape he was given by his friend the decision was taken. Arthur B. Rubinstein would be the composer. Rubinstein believed that the movie needed a deeper and more detailed musical approach that only a classically trained composer could offer. Therefore he created a synth-heavy score, applying conventional musical instruments, especially brass, that were used in specific parts of the score and in specific moments of the movie, in order to enhance the emotional impact. Apart from the technical issues of the composing procedure, Rubinstein had a very clear position about the ideas that would constitute his main themes and incidental music. And these ideas were two. The music of the helicopter, and the music for the main male character. He created two very simple thematic ideas – regarding their structure- a brief two note for the “Blue Thunder” and a four note for Murphy, the character Roy Scheider plays in the movie, an experienced Vietnam war veteran pilot with a problematic psyche. It’s clear by the way these two themes are used in the movie to outline specific moments, that the ultimate war weapon that is the “Blue Thunder” comes into the life of a man with very disturbing war memories that constantly haunt him. We are talking about a straightforward action movie that gives minimum character development sequences to the audience, however the score takes over and works both as a character intro and as an emotional link between a war machine and a man who is tormented by horrific war memories. Below i present – depicting seven particular moments from the movie – the way these two music ideas become a crucial part of the character development of the two main protagonists of the movie, the “Blue Thunder” and Murphy. It is a bit peculiar to refer to a machine as a “character” but according to the analysis below, you actually see how a brilliant composer’s work can transform a lifeless war machine to a real character who interacts and develops in conjunction with the main human character of the film. 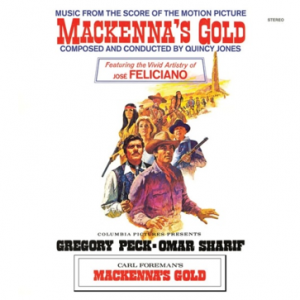 In the movie’s finale the one who commands prevails and this is evident in the score, as Rubinstein uses Murphy’s theme as an opening and closing music to the movie. However, the idea of the two character themes interacting and developing in various renditions as the movie progresses is a brilliant idea by a composer who seeks creative depth and substance to a blockbuster action movie. In order to present the score to its full function in the movie, i eliminated the dialogue and heavy sound effects track from the videos and kept only the music track (with some secondary sound effects). This is the introduction to the character of John Murphy, the police helicopter pilot. The score begins with a pulsating sound and gradually develops into the four note theme that is so familiar to every soundtrack enthusiast. It not only works as a character intro to a man of strong will and machismo, but also sets an almost epic tone for an action movie with lots of air sequences and confrontations. A little later in the movie, the same four note theme is used in a subtler and more discreet way, showcasing that beneath Murphy’s cool exterior there is a fragile psyche. This is the second and more subtle “Murphy’s theme” variation, that is used after Murphy is confronted by his superior regarding a psychiatric re-evaluation he must undertake. The man knows he’s got a problem and his theme is now more earthy and driven by his crashed ego. The audience realizes that Murphy is haunted by horrific war memories that hamper his professional credibility. The first appearance of the “Blue Thunder” helicopter marks also the first appearance of the two note theme. 52 seconds into the video i post above, there is an iconic shot – outstanding cinematography by the great John A. Alonzo – of the helicopter superimposed against the emerging sun in the background. A militaristic drum beat is followed by the two note theme that is menacing and clearly highlights the jaw-dropping appearance of the “Blue Thunder”. The audience is introduced to a war machine. This is an amazing piece of music that plays during the first time Murphy flies “Blue Thunder”. This is actually a romantic variation of the two note helicopter theme, that emphasizes the instant chemistry between Murphy and the machine. This works – in my point of view – as a love theme, a flying sequence full of grace and surprises for Murphy and his co-pilot, as if the machine welcomes and surrenders to the pilot’s commands. Even though Murphy is the one who flies the “Blue Thunder” his theme is absent in this scene. This choice shows that even if Murphy is in command, the helicopter is the principal character of the scene, providing the most joyful flight for the commanders without causing mayhem and wreaking havoc. A crucial moment in the movie is when Murphy has no other option but to steal the helicopter and try to find a way out of the serious trouble he is in. Immediately after his decision, his theme is entering the scene showcasing his determination and strong will to resolve the case his way. The importance of the scene inspired the composer to close this cue by using the “Blue Thunder” two note theme. 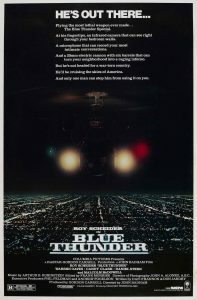 When things take a bad turn, Murphy and the helicopter begin to act as one, and in this scene, the music begins with Murphy’s theme and ends with the “Blue Thunder”‘s theme. This is the beginning of a lengthy sequence of aerial confrontation between the “Blue Thunder” under Murphy’s command and various attackers wanting him down. The music here enters in a powerful way and we listen for the first time Murphy’s theme and Blue Thunder theme playing together one after the other in an outstanding merging. Murphy is taking the situation under control for good and seem unbeatable. This is the moment, 23 seconds into the video, that Murphy’s theme and Blue Thunder theme play as one theme. It is the moment Murphy flies the helicopter, totally controlling it to perform a perfect loop and giving an end to the confrontation with the evil Colonel Cochrane. Murphy finally puts an end to his nemesis in a spectacular way, and the music highlights the trioumph by intermingling the two themes marvellously. In the end Murphy is the one who walks out walking, since he decides that “Blue Thunder” is connected with a very dirty story that cost the life of good people. He destroys it and definitely concludes a story of corruption and murder but also frees himself from the ghosts of his past.